Punching the air with both hands and yelling with glee, it is difficult to imagine that this suited thug had just been sentenced for his part in a brutal street attack. 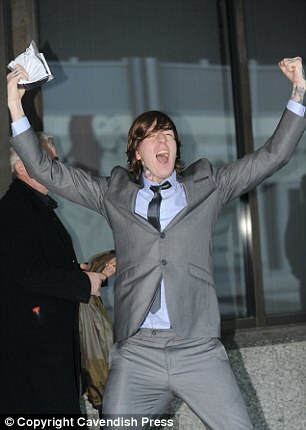 But sickening scenes outside court today saw yob Daniel Chrapkowski wildly celebrate avoiding jail for a drunken attack which left an innocent bystander in hospital for a month. 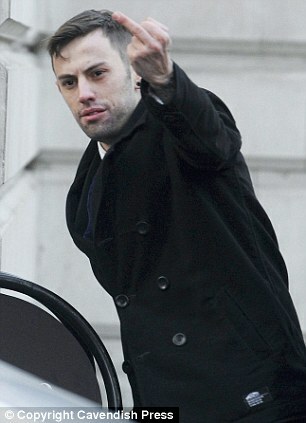 Chrapkowski shouted with delight while his lout friend Thomas Lane swore and squared up to photographers, after both were given non-custodial sentences by a judge. The two thugs, along with a third man, Oliver O’Neill, 23, had battered Joseph O’Reilly, 24, after he had dared to ask why they were kicking over wheelie bins in Manchester city centre. The drunken gang proceeded to savagely set about Mr O’Reilly, who was punched, knocked to the floor and kicked in the face and stomach before the cowardly trio fled. During the brutal beating, one of the gang boasted: ‘I’ve just been let out for GBH’ before Mr O’Reilly was knocked to the floor then repeatedly kicked about the head. He was knocked unconscious, suffered a fractured jaw and bleeding to the brain and spent a month in hospital where he was forced to have a metal plate fitted into his face. He is now wary of going out in public. These charmers kicked and punched a bloke that dared challenge them for behaving in a disorderly manner so badly he needed hospital treatment. Too true Karl… too true.